11/01/2016. London, UK. 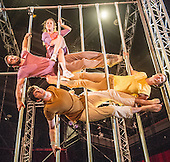 Ockham’s Razor return to the Platform Theatre London with a new full length show with original equipment that transforms simple five-metre poles into a myriad of walkways, spindles, pillars and pendulums. Presented as part of the London International Mime Festival.